If you don’t have the chance to attend the latest trade shows showcasing the best new smart trainers, there’s no need to worry. Plenty of people visit and post videos and reviews so you can check out the new products and get the latest news on how smart training is developing in the next year. At the Eurobike 2017 tradeshow, there were a number of new products being released by the big bike brands that should enhance your home training. Check out the video by Global Cycling Network and then have a bit more of an in depth read of the news and views from the video. Smart Trainers and Apps- what’s new for 2018? One of the biggest announcements at the Eurobike Show was from Wahoo dropping their game changing (or should that be ride changing??) KICKR CLIMB into the market. This new ‘add on’ product from the powerhouses at Wahoo is billed as an Indoor Grade Simulator. So from that you can have a good guess at what it does- makes your bike physically mimic the gradients on your indoor cycles. The KICKR CLIMB works when paired with a 2017 KICKR or 2017 KICKR SNAP trainer from Wahoo. The CLIMB works at it’s best with smart trainer apps such as Zwift so you can actually experience the gradient on the course or structured ride that you are following. The CLIMB will go to a max incline of 20% and decline of -10% giving you plenty of scope to follow the best courses out there. There is also a remote control so you can manually specify the gradients if you’re not using it with a 3rd party app. All in all a really great addition for a fully immersive indoor training experience. The Italian firm Elite who have been working with cycling tech for nearly 40 years had a whole new trainer to release: the Direto is now available for the coming winter training season. The selling point on the Direto is its highly accurate power meter outputs utilising a laser to measure power to +/- 2.5% accuracy. It is completely compatible with the whole range of cycling simulation software that you can access and can simulate gradients up to 14%. The Direto also offers good travel options as it is foldable and easy to transport. The footspan is 20 cm bigger than their previous model giving greater stability when training. This product isn’t brand new- it was released last year but it deserves an extra mention due to their commitment to getting ‘real feel’ cycling into the home. If you have around €8,000 to drop on a new bike trainer and a very large space to house it in then the future of indoor bike training can be yours with the Magnum Bike Treadmill. 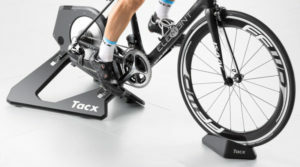 Created by the Dutch firm Tacx, one of the leaders of ‘smart’ cycling, this treadmill can be used both for bikes and running. 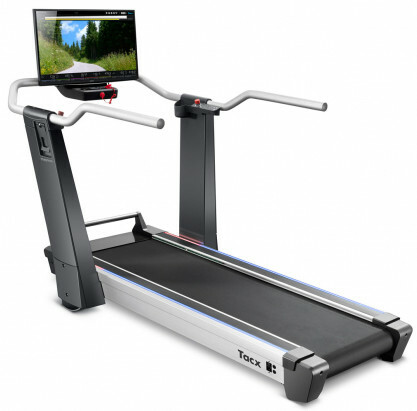 The treadmill has a top incline of 15% and can be switched between cycling and running mode with one switch, varying the treadmill surface to suit the different disciplines. I guess their target market is triathletes who have a home swimming pool with large poolside area so they can get all their training in without leaving the house! As you would expect, there is a bit of danger involved when using the bike treadmill for the first time (!) however if you have good balance (and deep pockets…. and lots of space…) then it’s worth trying out. Check out Peter Sagan giving it go in the video below. This roller trainer also isn’t a new one but has a number of good features that have resulted in it becoming the trainer of choice for professional cycle teams. The trainer has the advantage of being able to fit in the overhead locker on an aeroplane and has a low weight of 6.5 kg so not too hefty to carry around the airport. 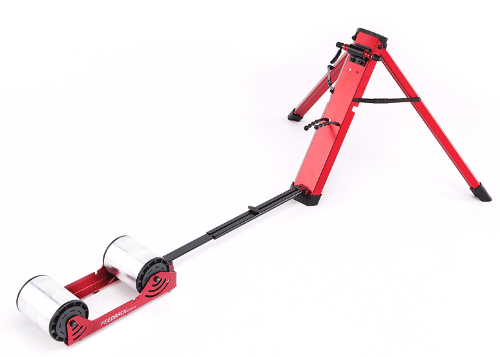 The heavy duty bag supplied with the trainer makes transport and storage a doddle.The trainer works using Internal Progressive Resistance (IPR) and can be used with a number of the smart training software providers giving it good versatility. The online cycling software that creates a 3D immersive racing experience with cyclists across the world had a number of new updates to announce. An Android version is finally being released this winter as well as new availability on Apple TV. Group workouts have also been added to the platform so you can experience a group ride. Developers were being coy about whether new courses are being released- apparently look out for one in October and one in March. 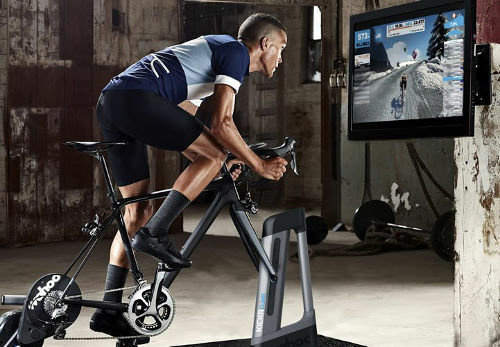 As you already know, Zwift isn’t the only smart training software available: check out our look at all of the software for turbo trainers in our comprehensive post. 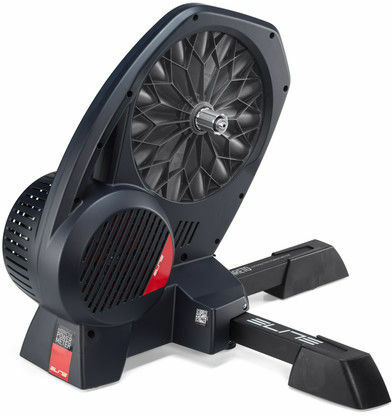 Also, if you want a bigger overview of turbo trainers and are not necessarily in the market for a very expensive machine you should read our very popular Best Turbo Trainer guide here.